A Holly Heider Chapple Flowers bouquet made the bouquet page in the new Southern Weddings Magazine V5. We are so proud of this truly delicious bouquet and many of the flowers are from our property. I called the bouquet delicious for several reasons. 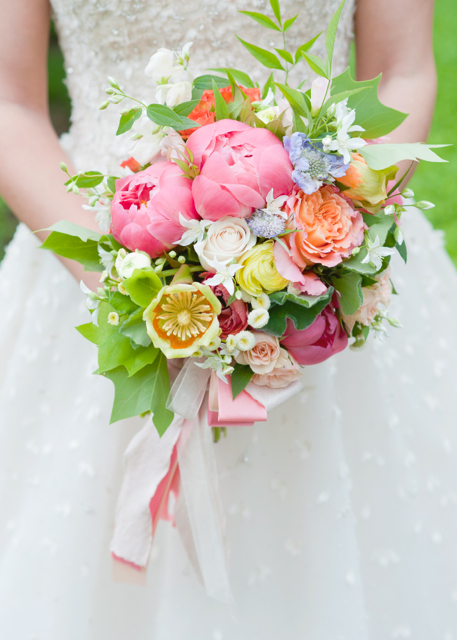 First off, I have never seen anyone use the tulip poplar flower in a bridal bouquet. The tulip poplar is the beautiful pale yellow exotic bloom in the middle of the bouquet, it has an orange band around the bloom. It’s very exciting to know that the flower holds and that it works amazingly well as a cut flower. It takes a creative opportunity like a photo shoot to make me reach outside of my comfort zone and snag blooms I have never designed with before. For that reason alone I love photo shoots. I have lived here with that tree for 25 years and I never once designed with it before. The flower held amazingly well, in fact it lasted for days. The bloom was firm and waxy, almost like a cymbidium orchid. The bouquet was also called delicious because when I reached up into the tree to harvest the flowers it rained sugar water all over my face and arms. I literally stood under the tree sipping dew drops that tasted like honeysuckle. That moment was like a spiritual experience, one of those moments when you so totally know you are living right, and doing what God intended you to do. The feverfew, scabiosa, and the lovely dainty white mock orange flowers were from our gardens as well. The mock orange and the tulip poplar were on our land when we came here. 25 years later I am still putting them to a delicious use!!! This beautiful photograph was taken by Cyn Kain, and you can expect to see more images from this shoot in Jan. This bouquet is YUMMY!!!!!!!!!! The colors and flowers just make you smile. Can’t wait for my tulip poplar to bloom this spring. The leaves are really pretty too….great shape and color. You are a flower genious!!!!!!!!! whoops your right, the leaves were an awesome addition and I meant to mention them. Guess what they held as well. I am so using this flower in the future. Also the pods that are on the tree right now are amazing painted gold in holiday designs!!! It is SOOO delicious Holly! Congrats again! This is beautiful and so very feminine. Love that tulip too!!!!!!!! Glad you like it Anna, perhaps we can design here one day at my home. Exquisite Holly! I used tulip tree flowers from my garden for the first time a few weeks ago…can’t believe I hadn’t properly noticed them before they are divine!! Evie, I have seen those flowers in the trees for 25 years and never used them!!! I always wanted to try, but I get so caught up in the day to day mom thing or in my weddings that I forget to play in my own yard. Ever since our trip to Europe I stroll my yard looking for things I have never used before. It’s so incredibly amazing to know this tree is in bloom in your yard when everything here is sleeping for the winter. Wish I could come see your Australia!!! One of my favorite bouquets! Really gorgeous and special. Congratulations on the feature! It takes a very tall ladder to reach the blooms on our tulip poplar…now I’m thinking to plant another.